The cost of the 2019 New Zealand Study Tour is $2350.00AU for twin share OR $2650.00AU for single. 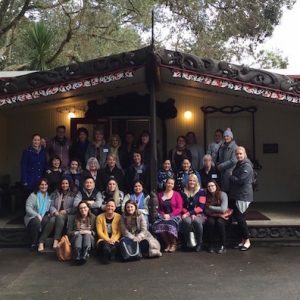 Together with INSPIRE: Professional Learning for teachers (NZ), REAIE offers a focused live-in professional learning opportunity that includes presentations and visits to a number of contemporary thinking early childhood centres. Provocations for reflection and dialogue are an important part of the intensive week of study. This study tour is open to all educators, with a particular focus on the birth to six years age group. The collaborative reflection and dialogue could also engage educators working in the early years of primary school. The New Zealand study tour is limited to 29 participants and requires 25 registrants to proceed. The New Zealand Study Tour programme is a live-in experience for participants only. Two Study Tour Leaders from the REAIE Committee accompany the group and facilitate group discussions. Readings are provided to participants prior to departure from Australia to assist with preparation for the Study Tour and to facilitate learning. General travel advice and tips are provided to the group prior to departure from Australia. The REAIE Office is available for any questions or concerns in the lead up to the tour’s departure and to answer any queries while you are away. This cost includes pick up on Sunday 18 August and drop off on Friday 23 August to a central Auckland location; accommodation; all meals; transport to venues; visits to centres and presentations. The fee is an all-inclusive cost to all participants and cannot be altered. It does not include airfares, insurance, transfers to and from the airport, phone calls, social costs, accommodation prior to or after dates listed or other associated costs. Delegates are to make their own travel arrangements. Details of the Study Tour Leaders’ flights will be provided as soon as they are confirmed. Participants will need to make their own way to a central Auckland location (details to be provided closer to departure) where a bus will meet them to take them to Vaughan Park Retreat. All participants must take out an individual travel insurance policy for illness, accidents or loss which may occur during the study tour. Accommodation will be in Auckland at Vaughan Park Retreat – a beautiful setting at Long Bay on the North Shore of Auckland. The beach nearby provides a serene atmosphere and the pleasant accommodation facilities are very comfortable. Rooms are within four lodges and an accommodation wing. Each opens to a courtyard or garden and provides a desk, comfortable chair, hand basin and wardrobe. Accommodation is single room or twin share rooms with a shared lounge, kitchenette and quality shared bathroom facilities. The food is homemade and of a high quality and the helpful staff are only too happy to cater for individual dietary needs. Please complete the registration form and submit with your deposit of $850.00AU. Places will be allocated on a first come first served basis on receipt of your registration form AND deposit. Your deposit will be fully refunded if we are unable to offer you a place in the Study Program. Payment can be made by credit card, PayPal or bank transfer. Participants will be notified as soon as the minimum number of participants is reached. Please wait for confirmation BEFORE arranging flights. N.B. A final invoice will be sent out in July 2019 and the final payment is due by 26 July 2019.